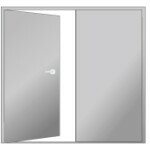 These Door offers a complete line of standard hollow metal doors in face sheet gauges ranging from 20 to 14. Choose from honeycomb, polystyrene, polyureahane foam and temperature rise cores. 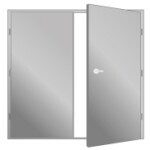 The Fuego Temperature Rise doors offer the maximum in fire and life safety as they feature 250 degrees F ratings. Fire ratings are available from 20 minutes through 3 hours. 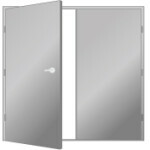 We also offers energy efficient doors. 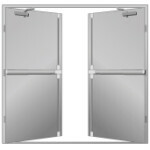 The combined durability and economy of these doors make them popular choices for a variety of users. These steel-stiffened doors are used in areas where optimum security and susceptibility to vandalism and break-in are of paramount concern. Door Long Island supply install and repair hollow metal doors and frames in the commercial markets. Have the door and need just a commercial door frame? We have knock down and welded frames to fit almost any opening. Need to configure one to suit your needs or give us a call 516-284-4020! 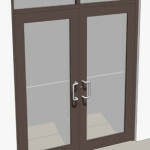 We can also provides custom door frames for front door style openings. 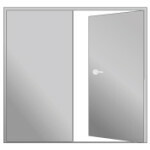 These frames can include windows on both the top and sides as well as special configurations for mullions, wide doors and opposing door swings.